KNOCKBEG College triumphed in a local ‘Battle of Wits’ to claim a spot in the final of a regional quiz competition. The team of Bill Fitzgerald, Jack Ross, David McDonald and Finn Cummins prevailed in the county battle of the 2018 Battle of Wits competition. 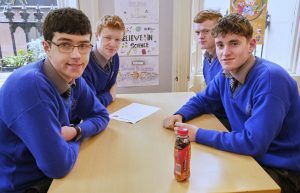 The Carlow school will join winners from Laois, Longford, Offaly, Westmeath, Leitrim, Roscommon and Kilkenny at a final in the Aidan Heavey Library Civic Centre, Athlone tomorrow, Wednesday 5 December. The event, which is aimed at transition year students, saw schools compete for the county title in Carlow Library, which organised the local contest. The brainboxes got to grips with ten specialist rounds, ranging from history to pop-culture. The St Leo’s team of Daisy Jay, Racheal Diyaolu, Niamh Millward and Lauren Walsh finished as runners-up and also earned a spot in the final.